At the recent and previously blogged about Disciplinary Literacy UnConference I attended, one of the day’s events was to break into teams of educators and work together to generate ideas on how to go about solving a literacy dilemma. I opted to work on a dilemma put forth by Masconomet Regional High School’s Jennifer Rabold which dealt with plagiarism in the English Department of a high-performing school. Her dilemma featured a highly qualified staff of teachers working with a motivated and capable group of students who were increasingly struggling with instances of plagiarism. The department had yet to harmonize on an approach to dealing with and working against these instances, which was the starting point for our group’s brainstorming. The conversation and analysis that followed Ms. Rabold’s presentation of the dilemma was extremely thought-provoking and challenging, prompting a fair amount of research and reading on my part in the days following the conference. In my next series of blog posts, I hope to share some of that research exploring what plagiarism is, why it happens, and what skilled educators can do to help equip students to avoid the pitfalls surrounding it. At both the start of our dilemma brainstorming and of my independent research, it was clear that plagiarism as it is generally understood is fairly straightforward. 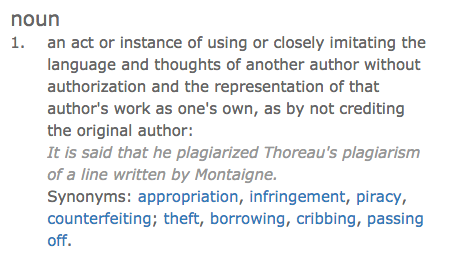 A quick dictionary.com definition essentially tells us that plagiarism happens when a writer uses someone else’s “language and thoughts” without their permission or without giving appropriate credit. At first glance, this seems reasonable. Both professional and student writers should be able to adhere to this definition. If it isn’t your work, it deserves a citation. Simple, right? However, as New York filmmaker Kirby Ferguson asserts in his four-part video series, “everything is a remix.” He defines the act of remixing as “combining or editing existing materials to produce something new.” Ferguson makes the point that, in today’s digital, collaborative age, essentially everything we do builds on something that has been done before. This idea echoes what C. Jan Swearingen points out to be a longstanding idea dating back to Plato which held that “individual ownership of truth was impossible because truth and, to a certain extent, meaning, existed full apart from any individual author” (“Originality, Authenticity, Imitation” 23). Ultimately everything we use in our idea-generation, composition, and invention can be traced back to the work of someone else. We build on what has been done before. So exactly how thorough does our material-using and credit-giving have to be? What is the role of citation and are there objective standards for what needs to be cited and what does not? How do we account for the collaborative invention upon which our own work relies? Is anything we create or invent really uniquely ours? I don’t have the answers to those questions and my goal with this blog series is in no way to go mining for those answers. My point is simply to explore the complexity and confusion that we ask students to engage in when compiling research and compositions of their own. The idea of citing the work of others in our own work is often much more convoluted than we as educators make it out to be and I look forward to investigating some of these complications in my next few blog posts. Serious problem in a lot of schools not just with students but among academics as well. Definitely. I think, if we’re honest, it’s a problem for almost any composer at any level in any mode or medium out there. Looking forward to the rest of this series! I love the connection you make to Kirby Ferguson’s “Everything is a Remix”.